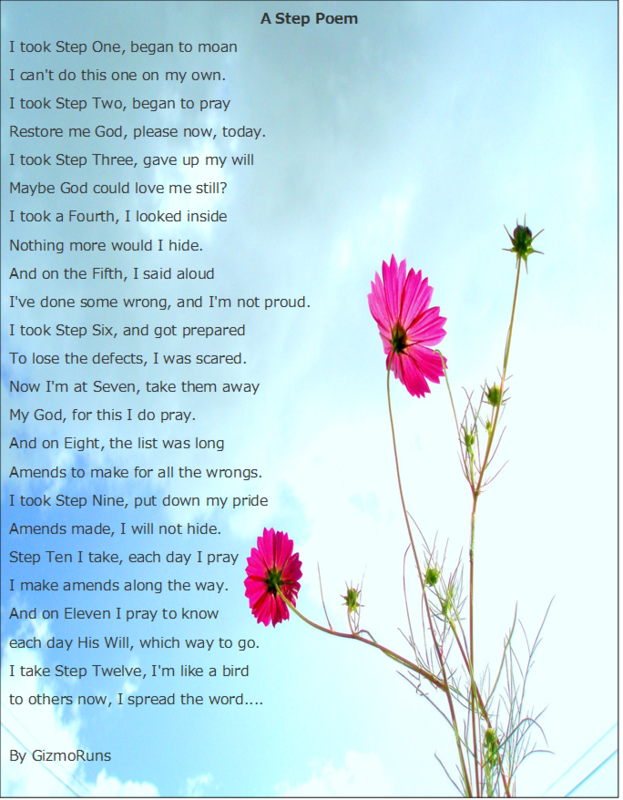 I was going through some of the stuff that I have collected and I came across this very cute step poem that I thought I would make into a picture. I can’t do this one on my own. Restore me God, please now, today. maybe God could love me still? Nothing more would I hide. To lose the defects, I was scared. My God, for this I do pray. Amends to make for all the wrongs. Amends made, I will not hide. I make amends along the way. Each day His Will, which way to go. To others now, I spread the word…. My pleasure. So nice to hear from you. We miss you! Thanks so much for this poem. Very nice !! And thanks for sending the other emails with such helpful tools on step 3 and 10. You have so many great and useful resources. Thanks for sharing them all with us. Thanks so much, that poem is just what I needed. I have a new sponsee that is working really hard and I just sent tot to her.